My name is Leah Aubert and this is my third year as the Learning Disabilities teacher at Southern Bluffs. I currently have students in grade 1 – 5 on my caseload. I grew up on the northside of La Crosse and went to UW-Green Bay for my degree. Shortly after getting my teaching license, I moved to Phoenix, Arizona to teach. In Phoenix I taught 8th grade Language Arts and Reading. I really enjoyed my time there, but missed seeing my family. They are spread from the midwest to the east coast. I decided to move back to Wisconsin to be much closer to all of them. 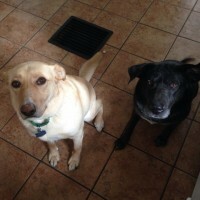 I currently live in La Crosse with my two dogs, Finnegan and Gypsy. I enjoy spending time with my family and friends, hiking, reading, and cheering on the Badgers and Packers. I also love spending time and skyping with my nephew Emmett. I am very happy to be back in the La Crosse School District as a teacher and feel blessed to be working with such a wonderful staff at Southern Bluffs Elementary. I look forward to a fantastic year with you and your child. Please do not hesitate to call or email me at any time with questions or concerns. Thanks for all that you do!